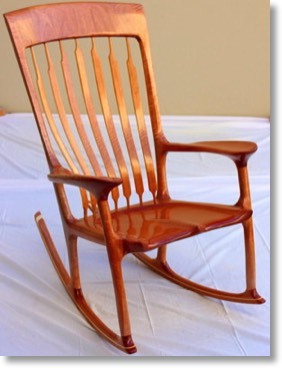 Thank you for your interest in a beautiful, extremely comfortable, hand-crafted rocking chair. Please look through my galleries, both shoji and rocking chairs, to gain a feeling of the craftsmanship and attention to detail I commit to every item I make. I take great pride in my work, and I will never compromise on quality. Sizes outside this standard range may incur a small extra charge. The photo on the left shows a chair made from Queensland maple. The above prices will cover this and most other Australian timbers. The more exotic timber species will cost more, depending on the price and availability at the timber yard. The cost of shipping will range from about $350 to $850 depending on your state, and will be added to the price of your rocking chair. The courier service I use is Pack & Send, and this price includes shipping insurance and warranty. I ask for a deposit of $1,500 when you place your order, and the balance is due when I complete the chair and before shipment. If you wish, I will regularly email you photos as I make your chair to keep you up to date on its progress. If you're in the Gold Coast, give me a call beforehand and you're welcome to visit the workshop and see the progress in person. I accept PayPal, direct deposit, and of course cash. Sorry, but I can't accept credit card payments at this stage. If you would like further information about my rocking chairs, please don't hesitate to contact me through the Contact page.